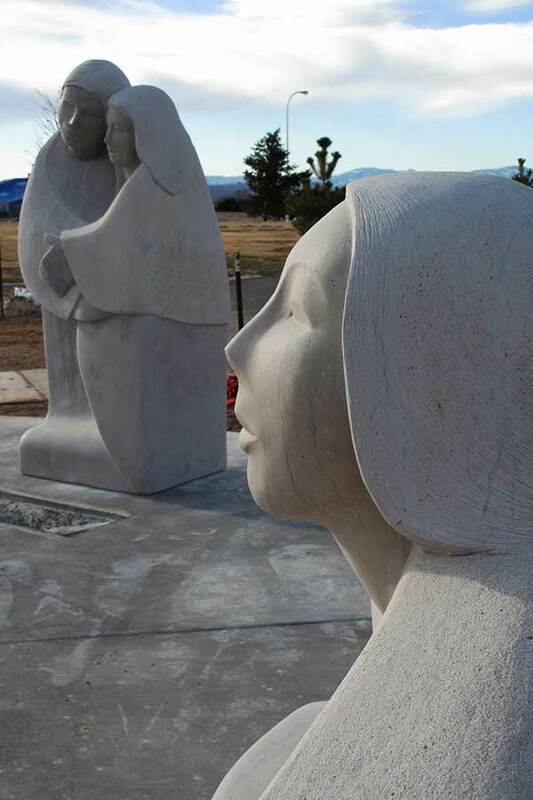 "I am a stone carver for many reasons. I love the physical and mental challenge of this medium. I am always seeking the most powerful and sensual form and creating the perfect tactile surface for each piece. I enjoy bringing the viewer into the sculpture itself, either by relating through personal emotions or by literally providing an opportunity to climb or sit on/in the form. 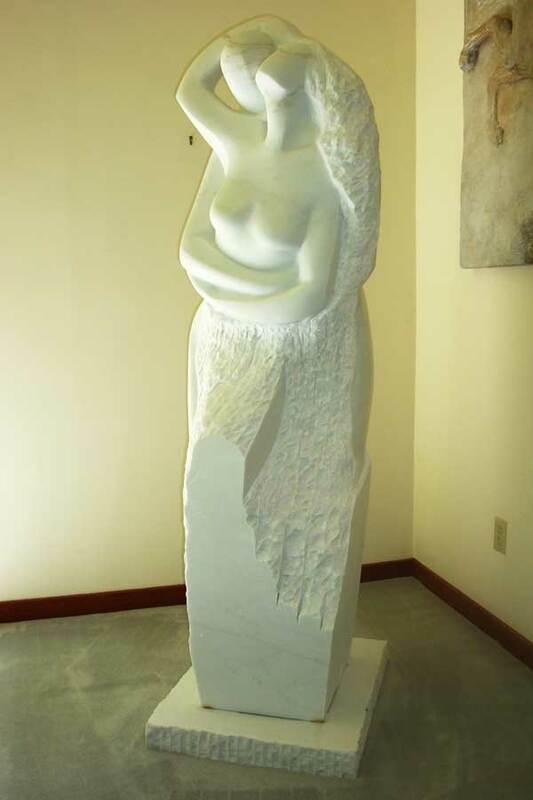 Carving stone and exploring its potential is what gives me energy." 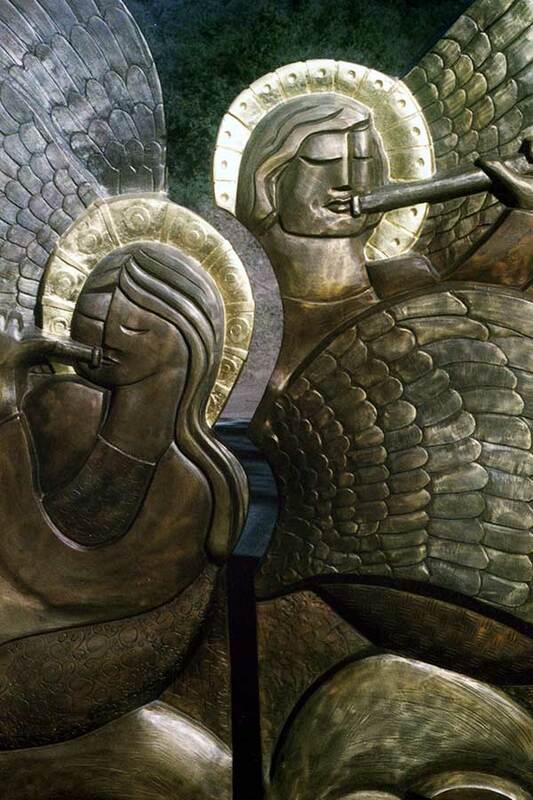 Madeline Wiener’s sculptures are recognized for their superb craftsmanship, beauty, and love for humanity. She explores the relationship between form and the emotion it projects. She searches for a balance between abstract and figurative art, because “the human figure is a blend of abstract shapes”. She was educated at the New York School of Visual Arts and currently lives in Denver, CO. 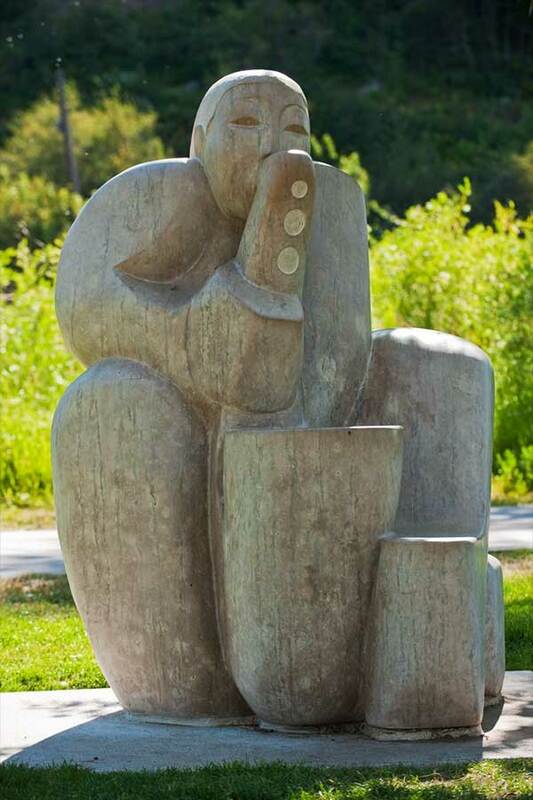 Her public sculpture can be found throughout the United States, as well as in Scotland and India. Madeline’s artwork is also part of many private collections internationally. 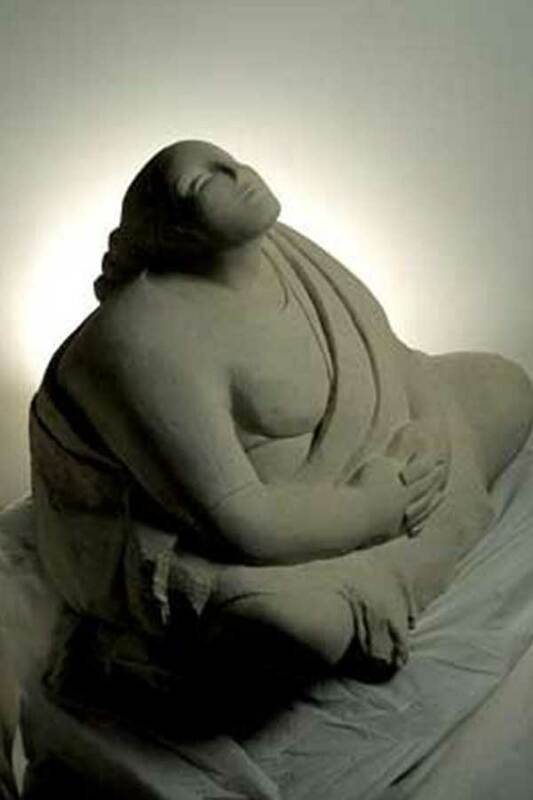 Madeline’s journey in the world of stone carving has been inspired by the many adventures and cultures that she has experienced since 1971, when she began carving stone. 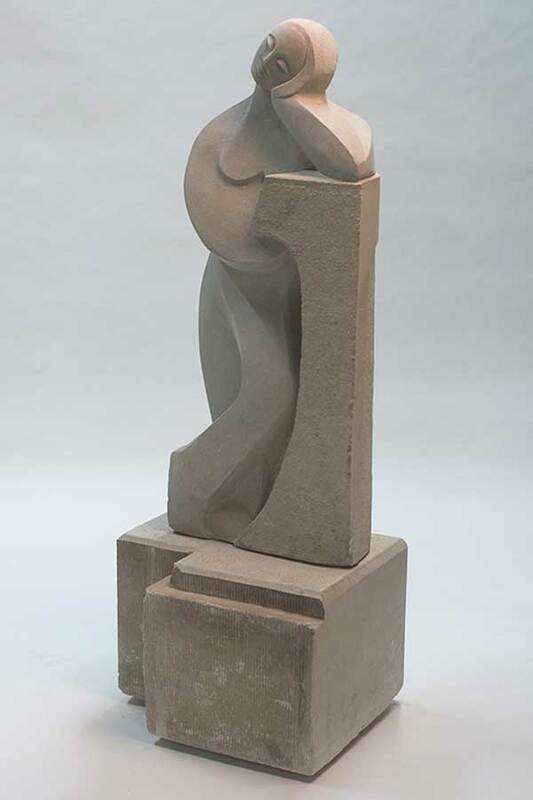 Her abstract figurative style suits the tactile material she carves. Presently she is focused on creating public art. Her interactive sculpture is designed to engage and delight the viewer. 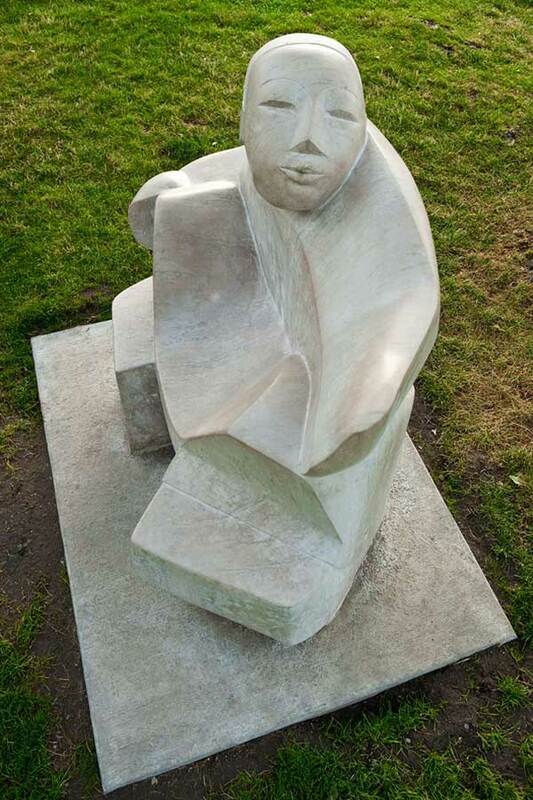 Her popular ‘Bench People’ are highly stylized, abstract figures carved in stone that welcome the viewer to interact with the sculptures by providing seating. They can be found in public places from coast to coast, throughout the US. These days Madeline spends as much time as she can at her second home in Marble, Colorado, where she creates sculpture in an outdoor mountain studio. 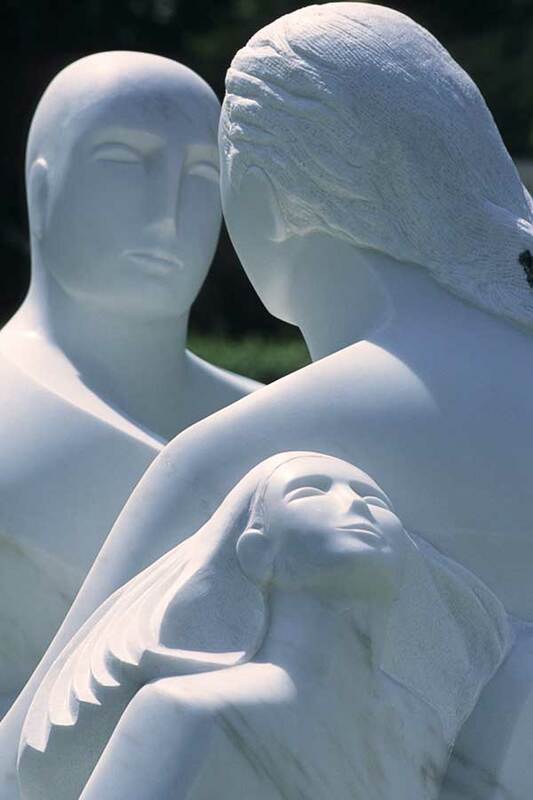 The program she founded, MARBLE/marble Symposium, has been hosting artists from around the world since 1989 and continues to grow each year. Somehow I find myself in a life I never dreamed of – and if I did have a dream, I doubt I could have imagined myself here. When I was young I dreamed of working behind the scenes, on stage sets on Broadway. I was discouraged, hearing such comments as “you’ll never get anywhere” and “it’s a man’s field”. Unfortunately, I listened, and I regretted doing so. I studied at NY School of Visual Arts, dabbling in commercial art, and then fine arts which included portraits and fairly classical oil painting. Mud. I found myself mixing colors that made all my images muddy. During that time, living near the Metropolitan Museum of Art and the Museum of Modern Art, amongst many other incredible art institutions, I found myself drawing in their galleries. I sketched so many sculptures, favoring the unknown classics of Roman and Greek and Cycladic times, and ultimately Rodin and Moore, stepping into a more contemporary style with Moore and Brancusi. After I’d returned from a trip to Italy, I shared my sketch pads with my mentor, Francis Criss, who recognized that all I drew was sculpture. Sensing my frustration with oils, he suggested I try carving, so I studied stone carving at SVA with two eccentric sculptors who really didn’t quite understand stone. 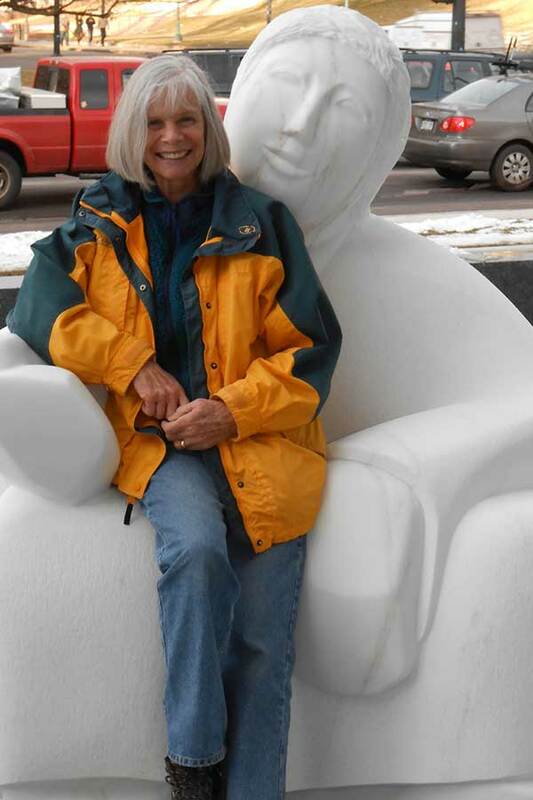 In 1977 I moved with my husband and two sons to Colorado where I met a local sculptor, Frank Swanson, (swansonstone.com) who immediately turned me on to power tools. He was impressed that I could use a hammer and chisel, but power tools? I think he had his doubts, so I had to prove to him, and myself, that I wasn’t afraid. Once I held a 9” grinder in my hands and made some cuts in to Colorado Yule marble, I was hooked. I was scared to death, but determined to excel in carving stone—stepping into a life I’d never imagined. Since then my style has evolved from fairly classical to stylized figurative art. I’ve enjoyed carving high reliefs for public places. I never forgot being scolded in the museums because I couldn’t resist touching the stone sculptures, so I embarked on a mission to create tactile art that begged to be touched. That was the start of my professional career in stone carving. 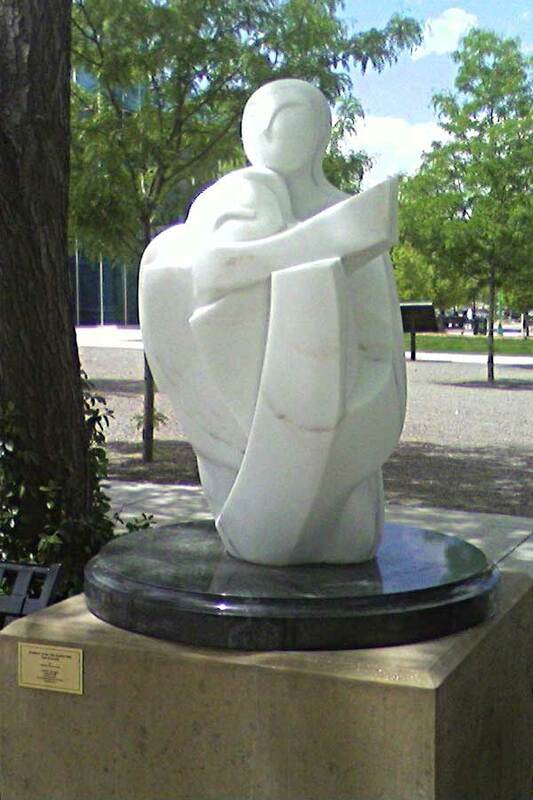 My first public sculpture was purchased by the Rehabilitation Center for the Blind here in Colorado, and I taught a couple of workshops on stone carving to the visually impaired, and that was so well-received that I pursued putting my art out in the public. But touching wasn’t quite enough for me. I wanted the viewer to realize all the textures and actually be able to become a part of the art by sitting or climbing on it. “Spirits of the Land” was my first major commission for the City of Evergreen, CO. It is so large that multiple kids of all ages can climb and sit on it and create their own stories about the sculpture. After that I was asked to create sculpture for a library and that was when I created my first of what was to become a series of “Bench People”. These enormous sculptures depict extremely stylized whimsical figures that beg to be sat on. They most often tell a story of the setting they are commissioned for, be it a hospital, library, school, park, etc. I always meet with the people who live in the towns where my art will be installed. 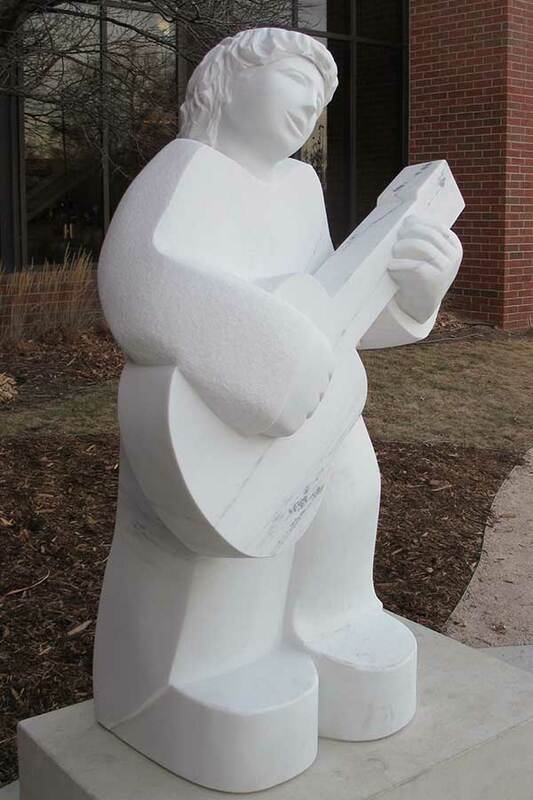 I work with committees, architects and landscape architects, city planners, etc., so I can fashion the right content for each unique sculpture I create. I also put on workshops to educate people about how the sculpture came about…why was I selected to create such a thing? How did I create it? What kind of stone is it? What tools did I use to create it? How did I move such enormous stones? All those fair questions need answers, and I always allow time to stay in the communities where my sculptures become their sculptures once I leave….but I leave them with an understanding of all those questions. One of the things I’ve enjoyed is running workshops. I was invited to teach at the Art Students League of Denver (a school modeled after the Art Students League of New York), and back in 1988 I asked their board if I could run a workshop on stone-carving up in Marble, CO. I invited sculptor Greg Tonozzi, who is a Marble town local, to help me design the lay of the land in order to have many participants set up to carve with power tools. That was the beginning of MARBLE/marble, a stone carving symposium that draws talented sculptors world-wide and continues to this day. It was a vehicle that got me to carve commissioned sculptures in Scotland (twice) and India (four times). The mission of MARBLE/marble is to unite like-minded people to create in the woods of Marble, CO, where I now reside and carve part time, when I’m not carving at my studio in Boulder, CO.
What I once felt was impossible when I looked at the giant classical sculptures in Italy has become a wonderful life that I truly enjoy sharing.